A lot like Treasure Hunt, pick 3 charectors to enter the unknown. You pick a square to enter. You never know what you'll find. A mummy covered with riches, or a curse, or even a booby trap or something that shouldn't even be inside! Yay! I get new characters!! Hihey: I can't hear you. Hihey: We might. Now David, you search G4. I'll search G5. SCOTT: OK guys, let's go through the checklist. Ropes? DOUG: Hey Scott! Just thought I should mention this, but I'd wear something different if I were you. It's bad luck going into the unknown while wearing a red sweatshirt (/jumper). Scott looks down and gulps. He is indeed wearing a red sweatshirt, "Heh. You're right, Doug! Be right back!" he admits, then runs off to change, coming back wearing a blue windbreaker. SCOTT: Onward and inward! I'll take J-10; Otto, you take I-9; Doug, you go to H-8, and Arnold gets G-7. G4: David finds a bag dropped by a tourist. Not much use, but never mind. Maybe next time. J10: Better watch out in your searches, guys. It's been done before. Scott finds http://web.arch.ox.ac.uk/schoolarch/institute/skeleton.gif this! 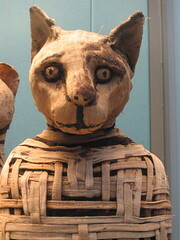 I9: Otto manages to come across http://static.flickr.com/53/126177685_18e43ac551_m.jpg a cat mummy. It's riches, however, were stolen years ago. H8: Doug comes across something VERY surprising. Who knows how it got there? It's a Traction Engine! Mr. Fagin: If found a tourist's bag! I wonder if there's cash in it! Hihey: Cool, now if I can find a portal to the realm of "what's down there (treasure hunt)" I could stuff my annoying crew in there. David: But Clint Bowyer told me that you were the annoying one. Hihey: For that! I'm gonna send you down that dark passageway to... when did you meet Clint Bowyer? You hate Nascar. Spyro: I'll go down the dark passageway, I can breathe fire and light it up. Hihey: It's supposed to be a punishment for David's smart mouth remark. David, you go to E9. At E9, David finds a mummy's tomb. Excited, he opens it up, and finds it is actually a trap. David accidently drops his wallet into the hole, and returns emptyhanded.